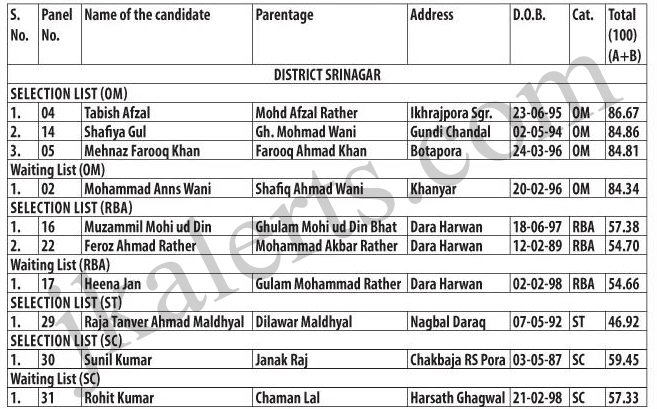 Jammu & Kashmir Directorate General, Youth Services & Sports Provisional Selection list of candidates for the post of Class-IV (Groundsman) District Cadre Srinagar. Reference: i. Edu/Tech/Phy/06/2007-ll Dated 10-01-2017. 1. The select list is purely provisional and subject to alteration/modification and as such no right accrues to the candidate to claim selection/appointment against the post as a matter of right on the basis of his/her mere inclusion in the provisional select list and shall be subject to the verification of all certificates/documents/required undertakings. 2. The provisionally selected candidates, as indicated herein above, are advised to report to the office of the District Youth Services & Sports Officer concerned within twenty one (21) days from the date of publications of this provisional select list in the print media along with all original certificates viz Date of Birth, Matriculation Marks Card, Higher Secondary Part-ll (10+2) Marks Certificate, State Subject Certificate, Fitness Certificate, NDC from the Nationalised Banks/Financia! Corporations/ Employment Exchange/ Industries Department, Category Certificate, wherever applicable, for verification from the concerned agencies as required under rules, failing which the candidature of the selected candidate shall be deemed to have been cancelled and the candidates next in order of merit from the waiting list shall be considered/appointed under rules. 3. Any candidate found guilty of submitting fabricated/tampered documents shall be liable to criminal prosecution under law and the selection of such candidate shall be deemed to have been cancelled ab-intio. 4. The selection list shall be subject to outcome of any writ (petition)(s) pending if any in court of law of the competent jurisdiction. 5. The provisional selectee are advised to see that their particulars are correct and in case of any error or omission/objection, they may approach to the concerned District YS & Sports Officer along with documentary proof for seeking correction within ten (10) days from the date of publication of this provisional selection list and no representation shall be considered afterwards.